AlgEternal Technologies’ Logo represents the idea of using Nature’s micro-factories, microalgae, to produce anything imaginable. Microalgae are Nature’s Nanotechnology. We recognize the importance of microalgae on a global scale with local benefits. Microalgae remain the single largest producer of oxygen on the planet. They produce the basic energy molecule, glucose, via photosynthesis, needing only water, carbon dioxide, trace nutrients, and sunlight. The single most important biochemical equation on Earth is the photosynthesis equation. Without photosynthesis there could be no life as we know it. And microalgae, specifically, cyanobacteria, were the first organisms to perform photosynthesis. Consider this, without photosynthesis organisms would still have to scavenge for the energy molecules needed to support life. Microalgae became the base of every ecosystem in which they occur, aquatic and terrestrial. They provide the food source needed by non-photosynthetic organisms, also known as “heterotrophs”. From glucose other organic molecules are made, e.g. lipids (fats/oils), carbohydrates, and proteins. We use glucose in our energy pathways at a cellular level. And we use oxygen in respiration as well. In fact, respiration is simply the reverse of photosynthesis. AlgEternal’s tagline “Harnessing the Planet’s Primary Producers” says it succinctly: we use these invisible, unrecognized, and underappreciated microorganisms to do what they have been doing for us for over 2.7 billion years. They are indeed the architects and manufacturers of all that we rely upon for our existence. They terraformed the planet, converting Earth’s atmosphere from a reducing, oxygen-lacking environment to the oxidizing, oxygen-rich environment we now enjoy. They built the mineral resources we now use indiscriminately. They are responsible for the crude oil and natural gas we use…yes, petroleum is a biofuel made by Nature over hundreds of millions of years using dead microalgae. They are the first to colonize bare rock and soils, in a symbiotic relationship with fungi known as “lichens”, which contributed to the weathering of rocks and the formation of soils (pedogenesis). All land plants derive from a group of green algae. Microalgae in the oceans still produce more oxygen daily than any other photosynthetic organism. It would be difficult to write about everything that microalgae can do…it might be easier to figure out what they can’t do. 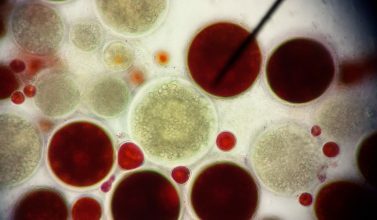 The potential applications for microalgae as sustainable products combined with their application for ecosystem services such as wastewater treatment, carbon capture and use, nutrient recycling, soil rejuvenation, and bioremediation, are limited only by our understanding and knowledge and imagination of how we can harness their incredible powers. Dr. Schonna Manning is a phycologist, molecular biologist, and natural products chemist at the University of Texas at Austin. She is a Research Assistant Professor in the Department of Molecular Biosciences, Director of R D for the UTEX Culture Collection of Algae (UTEX CCA), and a Research Fellow with UT’s Center for Systems and Synthetic Biology. Dr. Manning s research exploits the biochemical diversity of microalgae for the production of materials, fuels, feedstocks, and specialty chemicals. Thanks, Bonni. We know Dr. Manning very well and hold her in high esteem! She has contributed significantly to our early research and testing of our Vertical Growth Modules. And she has taught our CEO! Thank you. David Ramjohn is brilliant and we are so proud to have him lead our team into the future. Intriguing fact about how algae produce more oxygen than any other photosynthetic organism in the world. So many wonderful things can benefit from algae and yet, so misunderstood. That is very true Jay. We are trying to educate and create awareness. We truly could not exist without microalgae. Thank you AlgEternal for putting emphasis on the importance of this fascinating organism and educating us all. It’s our pleasure. We have a lot more to share with you and the world. I am so fascinated with the benefits and importance microalgae has for us. I’m so excited to keep learning about it. Such a significant organism that allows life on this planet to exist the way it does. Cannot wait to see how diverse algae can be and how many countless applications there are for them!